Here at CData, we provide access to SAP data in numerous ways including ODBC, ADO.NET, SSIS, and more. Our products work with configurable schemas that allow the developer to select tables and SAP queries they would like to access. The schemas are written in files with an .rsd extension and include information about columns and their types. Schemas can be manually edited for richer control, but we also offer tools to generate the schemas based on information in your SAP system. All of our products include a few sample tables from SAP, but to get the full range of SAP data, you can generate your own schema files using the application mentioned in this article. We will use the included CreateTableSchema and the CreateQuerySchema stored procedures to generate schema files. CreateTableSchema will create a schema file (.rsd) based on a table in SAP. 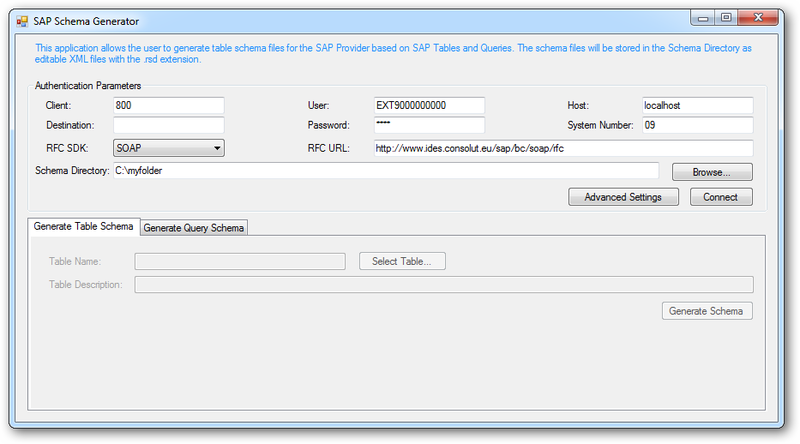 CreateQuerySchema will create a schema file (.rsd) based on an SAP Query. SAP Query schemas can be based off of both User and Global queries. See the help documentation for information on stored procedure inputs and calling stored procedures. The attached application can be used to generate schema files for both SAP Tables and SAP Queries. These generated schema files can be used with any of our SAP products. The application was built using the ADO.NET Provider for SAP, and the code for the application is included in the demos for the ADO.NET Provider.